Oakes & Smith - Closer To Home (featuring Jon Anderson). 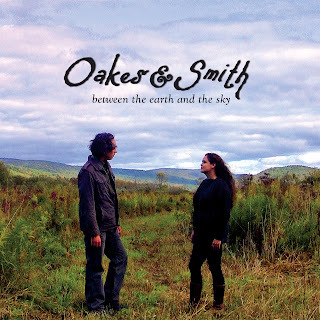 Background words - Oakes and Smith perform gentle, acoustic folk with voices blending in close harmonies. They sing soothing and soulful tunes inspired by nature, love, spirit, art and poetry. The harmonious blend of their voices creates an ethereal sound and unique quality not often heard in today's popular music, and their songs evoke a sense of wonder, expressing themes such as love, beauty, innocence and mystery. Their debut album, First Flight, mixed by Grammy-winning engineer Oz Fritz and released in November 2013, was received warmly by listeners and critics alike. The duo has appeared at The Guthrie Center in Great Barrington, MA; the NJ Folk Project in Morristown, NJ; Infinity Music Hall in Norfolk, CT; FloydFest in Floyd, VA; the Hudson Music Fest in Hudson, NY; at Andrea Clearfield's Salon in Philadelphia, PA; at the Kripalu Center for Yoga & Health in Stockbridge, MA; and have had a weekly residency at Canyon Ranch in Lenox, MA since March, 2014. They have opened for HuDost, The Boxcar Lilies, and members of Barefoot Truth. Both Robert and Katherine were born into musical families and started performing and writing at a very young age. Katherine, whose grandfather, great aunts and uncles, father and mother all sang, started harmonising as a teenager with her parents' Connecticut-based choral group. She then went on to perform musical theatre pieces and jazz and pop songs in high school and college productions. Katherine has also combined her love of singing with an affinity for writing, visual art, stagecraft and acting. Robert began as a kid singing and playing bass guitar in his blues-and-jazz-singing father's band. Later, he sang and played in many New Jersey-based rock bands with his brother before going on to self-produce several albums of original songs and perform in many New York City-area venues. Robert has been writing stories, songs and poems for as long as he can remember, a passion that continues to this day. They both relocated to the Berkshire Hills of Western Massachusetts, a peaceful place filled with natural and cultural beauty, which very much influences their sound and creative process. Ever since their first — unexpected — meeting there during the summer of 2007, they have both felt like there were unseen hands drawing them together to create something more than each were doing on their own. Since then, they have continued to let themselves be led along a path of collaboration, staying open and saying 'yes' to the possibilities it offered. 'Closer To Home' is the final song from the five track EP 'Between The Earth and The Sky'. With enchanting harmonies and vocals, this is a small collection of songs that leave a big impression. Beyond guitar, piano and drums we are treated to cello, mandolin and even bamboo flute, all of which just add to the richness of the work. If you only have a passing interest in folk orientated music, check this EP out, it really is something quite special.